I don’t have another Christmas themed Dylan tidbit for 2012 (though I’ll remind you that today is an excellent day to listen to his album Christmas in the Heart!). If you’re not up for that, here’s the video for Dylan’s last ever single (to date, he may well have one next year for the new album). Returning for his third shot as director is Nash Edgerton. You’ll recall him from the brutally violent “Beyond Here Lies Nothin’” and the goofy, but still sort of violent, “Must Be Santa”. What has ol’ Nash served up for us this time? Well, check it out! 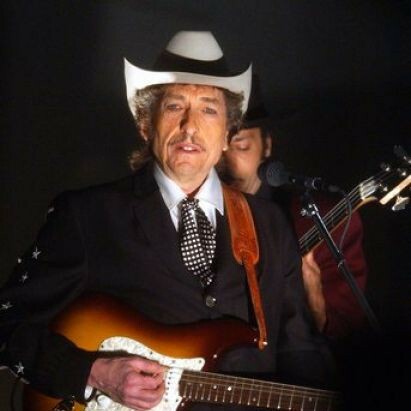 To my mind, this is, without a doubt, the best Bob Dylan music video of all time (though hold for next week….). This one is astoundingly great – it almost comes across as an apology for the gendered violence of his first Dylan collaboration. Here Edgerton uses the standard trope of the charming white doofus who chases after a woman on the street (a staple of perfume ads during my youth in particular) and turns it delightfully on its ear. Every time through Edgerton ups the levels in very unexpected ways. The narrative through line here is, again, very violent, but this time it is a kind of comic violence that works. I also enjoy the (almost unrelated) shots of Dylan and his bizarre entourage of hispanic tough guys and a guy oddly dressed in Kiss gear (seriously, WTF?) striding down the streets until they walk right over our erstwhile hero. I love this video. It’s just one of my most favourite things of this whole year. I’m also quite fond of the song, the first on Tempest, Bob Dylan’s 35th album (about which more on Saturday). Ironically, since I didn’t much care for Together Through Life, partly because of the collaboration with Robert Hunter, this is one of the things I like best about Tempest – the only collaboration with Hunter. You just never know. Musically, this is the liveliest song on the album: it owes a lot to his earlier “Thunder on the Mountain” but also to “K. C. Moan” a Memphis blues song that even includes some of the same lyrics. Good song, great video. Merry Christmas! That was . . . creepy and weird. “Duquesne” is a cool word, though.